​​I Made It Out chronicles Candy’s incredible break through from religious experiences that were destroying her spirit and family socialization that was imprisoning her mind. Even though something did not feel right, it was hard for her to know what it was or how to break through it. Because growing up feeling spiritually, sexually, and socially oppressed was the accepted norm for Candy Holmes. Candy’s story about her journey into freedom and joy far greater than she could have imagined will help release the power of your human spirit to break through what has been limiting your life. Part inspiration and part creative challenge, Soul Smarts for Day Starts offers activities, journal prompts and ideas designed to super-charge your positive attitude, enhance your bliss, smarten your soul and show you how to get more pray and play into your day. In Hush Hush, author DeShannon Bowens delves into sexuality and sexual abuse through a collection of personal interviews with the Peterson family as they explore their sexuality beliefs, attitudes and the possibility of child sexual abuse occurring within their own family. Bowens makes a compelling case that intergenerational healing from sexual abuse cannot happen in Black communities without releasing shame based sexuality narratives from the past. Hush Hush, stresses the importance of empowered sexuality narratives and honest communication within families as a key component in preventing and ending child sexual abuse. Ann Jenrette-Thomas, The Happy Law Practice: Expert Strategies to Build Business While Maintaining Peace of Mind! Is it really possible to be a Rainmaker AND have peace of mind? . . . Yes! The Happy Law Practice offers guidance on essential business development skills without sacrificing work-life balance. Covering such topics as productivity, networking, branding, organization, and stress management, The Happy Law Practice gives you the skills that all lawyers need to THRIVE in their career. Whether you are a well-established lawyer or just starting your practice, this book offers tips, strategies, and innovative insights that is sure to help you succeed. As a child, a social worker once told Tonia that she would likely grow up and be like her two parents. Throughout her life, she has proved that social worker were wrong. 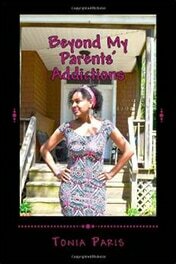 Beyond My Parents Additions is an autobiography that gives insight into the mind of a child of drug addicted parents. There are various issues brought to light of the life of these type children and the story of how there is life beyond these issues. Giving the children of addicts a voice and also giving insight to addicts of the effects they may be having on their children.